Back in September, Motorola Mobility announced that some of its handsets from 2011 and later wouldn’t be making the jump to Jelly Bean. In an effort to smooth things over with exiled customers, the company pledged that it would offer a $100 rebate to those who trade up to a select Motorola smartphone. 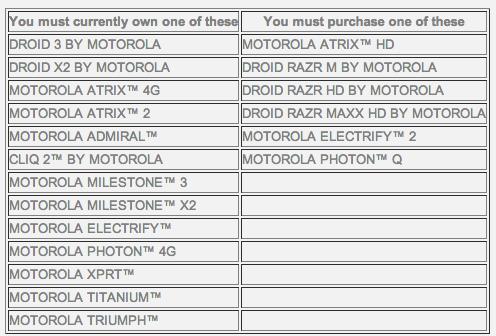 Today, the Google-owned Android maker has released a list detailing which phones qualify for this promotion. If you’re among the many who purchased a Droid 3, Droid X2 and Photon 4G, it looks like an official update to Android 4.1 is out of the question. It should be noted that this offer doesn’t affect your wireless contract’s terms and conditions (read: ETF may still apply). However, if you’re just aching to pick up a Motorola phone that released in 2012, then why not score a $100 credit for your troubles? Move past the break to see which other devices made didn’t make the cut. See folks, this is why you need to go with Samsung. They are the world’s largest Android phone maker, and in order to keep customers flocking to Samsung, they constant release updates. Most Samsung users overseas (UK, Korean, Europe, etc.) will receive Jelly Bean by the end of the year. If this were a Motorola phone (the Galaxy S III) Jelly Bean wouldn’t be rolling out until at least February or March of 2013. I love my Sammy phones! Anyway, look at the list below to see if you qualify for $100 credit on your Motorola phone.